DeployHappiness | Reset User Passwords with AD Self Service Portal – Updated! This is great. I’ve been working for a tech college for a few months now, they had no sspr service going on and I was getting pretty tired of resetting passwords (especially at a start of a new semester). I had to tweak it a bit to make it work with the users personal email addresses because the main carrier here (Montreal area), Videotron, won’t let us send emails to a phone number. Also I added a random token system for added security as email addresses are more of a risk. This frees me up while the students work on a web based portal. Cheers! Alex your updates sound great, do you have a github to contribute and share your mods to by any chance? I do, it’s empty but I’ll try and put it up there when I have a minute or two and share the link. Hi, will this work without Exchange on our network? How is the script sending SMS? will this work with G-Suite smtp relay? How do you get this to work with Exchange online? Has anyone handled the attachment “text_0.txt” that some send with the body of the text message? Does it store attributes on an AD User account? Because that is read-permitted to all domain users, and would concern me. Or does it store on a backend encrypted database? Hi Gary – that password isn’t stored in AD at all. At first thanks for the script. I’m working on an IT Department and my boss ask me to implement a system like that to AD passwords reset. I’m trying to implement your script in our LAB environment, although, We have hmailserver configured to send emails, I know that I need to change all exchange lines on your script to smtp scenario but I can’t found how. Sorry for replying to this old string. I would like to know, what mechanism required to send SMS? I could not notice any mention here how the carrier is used to send messages. I know this is an old post but, I am hoping someone could help me. I have the same issue that Doug had with T-Mobile and you can also add Goole Fi to that where the phone numbers are coming across with +1 in there. Has anyone come up with a way to drop the +1 when i comes across? I keep getting the following error, not sure if its the relay connector ? Can we have some script for web based solution, instead of mobile phone, means a user can login from fellow user machine and would able to reset and unlock his or her password using the web login and answering few security questions. I am experiencing the below error when executing your script. FYI i am using exchange version 14.3.235.4001 and i don’t have the ability to run this from the exchange server. Is there anything you can tell me about the error to push me in the right direction? I wrote up a blog post on doing the verification through email rather than through a phone. have a look if you are interested, works with o365 and you are welcome to copy it onto this page as well. Sorry, thought I would clarify as well. All our users have an AD attribute which has a recovery email address which is outside our email domain meaning they can reset the AD account as long as they have access to the recovery email address set in AD. Has anyone had any problems with Verizon as a carrier? It looks like on Android devices they’ve implemented some kind of integrated messaging and the texts have a from address of [username]@vtext.com On iPhone, the from address is right, but instead of actually getting the text in the body of the email, it’s sent as a .txt attachment. I’m trying to work this out, but having some issues. At first I was getting messages back saying it couldn’t match my phone number. I ran the query manually and the test account came right back. Then I looked at the emails that the reset mailbox was getting and from my provider(T-Mobile) includes +1 in front of my 10 digit cell phone number. It seems like this does invite some randomness into the results depending on how a particular provider inputs the numbers. However for some reason when I echo $phone after that operation, I get [10 digit phone number]@t. I’m not sure why the string is ending there instead of at the @ like it does in the original script. Thoughts? I know this thread is a bit dated. Just wanted to see if it was possible to allow modify the script to allow a user to choose the password? Then the password would be set to what was in the subject of the text message that the user sends to the service. Would it be possible to modify this script to also allow self-service account unlocks? When the password is reset, it unlocks the account as well. Or do you just want it to unlock the account for the user without resetting the password? I’d like to have a trigger word that would only unlock the account instead of resetting the password. Finally got around to testing this out. The only thing I had to change is in the search for the “unlock” string, I had to use “*unlock*” because some providers provided extraneous information in the body. Thanks for the mod and for the original script! No problem at all Doug! This script works great. The only issue I am coming up against is that once I receive the “Password Reset” email with the LDAP user info (the logging info) it sends the script into a loop. The script then takes the “Password Reset” email and tries to find ldap info in our AD and I then receive the “invalid number” email in the “Reset Users” mailbox and then the loop starts. As a fix I have a rule for the “Password Reset” email to go to another folder but would like to see what I am missing or what could be done so I dont need to use a “work around”. is there a way to single out the Password Reset email so its marked as “unread” and would not affect the true password reset emails from users? Any suggestions or help would be greatly appreciated. I edited the codes to use native AD powershell and using a SMS gateway. Thanks for the original code! Azza please post Edited Script. Hey Can you please post edited script. Even i have sms gateway. was included, verify that the path is correct and try again. Hi Nick – you need to download the Quest AD Cmdlets to use the command get-qaduser. You can use the normal AD version of this script (found a bit higher up on this page) if you would prefer to use native tools. I guess I’m unable to find the script that does not use Quest AD commands. Both links below use QADuser commands. Do you have a direct link to the script that does not use qaduser cmds? Hello. I am getting an error. I ran 1st on Windows 7 with Exchange tools installed. Then on my Exchange server. I get the same error on both. I have exchange 2007 build 83.6, which should be SP3, so I have the version in the script as Exchange2007_SP3. For the server variable at the top of the script I have my Client Access Server, $MailServer = "https://mail.mydomain.com/ews/exchange.asmx&quot; where mydomain is the actual name. Found the cause of these errors. For some reason the script only works when set to SP1. Thanks for the update Neil! What happens if you run this script on your exchange server? sure that the assembly containing this type is loaded. make sure that the assembly containing this type is loaded. Two things – did you download the API? Did you change the exchange version in the script on line 21? In my first comment I was run the script on a Win 7 machine. In that machine I installed the API and changed the line 21. In second comment I run the same script in Win 2003 server. But I did not get the API for windows 2003 server. Changed the line 21. How do I do this without an exchange serveR? I set this PowerShell script up. but im never receive a sms back from the exchange server. I also ran the NetBIOS command to see if the password has changed and it hasn’t. Script run fine with no errors. AD has the telephone phone number in this format 1234567890 (no spaces or special characters). Also we use iphones it makes the sms into an email but the message becomes a txt attachment. Should that even matter as long as we type “reset my password”? Office 365 does allow text messaging ONLY in US, Canada & Romania! Or am I being somehow mistaken? I have filled in the details at the top of the script. I assumed to save the script as a .ps1 extension. I have sent a text from “three UK” mobile phone and recieved it into the inbox of my password reset mailbox. No other message etc no failure no sms sent. can any one suggest me…. 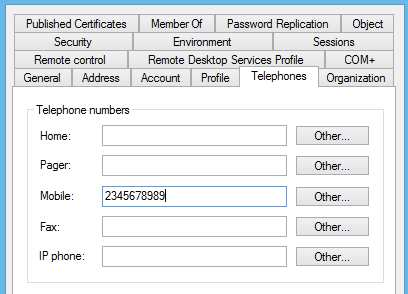 Do i need a SMS Server set up in my enviornment before using thsi script…? You just need an exchange/office365 server. sry for the late reply….in our environment we do have exchange server but how would i enable sms thing? The script will email the user back. The email is sent to their phone number’s email address – the carrier converts it into a text message. Any ideas on how to use the Reply-To address instead? Ok so I found a work around by using an external SMS Gateway. Only slight issue is that mobile numbers need to be stored in AD without the + prefix. What did you need to do to set it with external SMS gateway? Does that work with any UN mobile network? Thanks for very valuable script. Our boss doesn’t like fully self serve service for audit reason, so can you please guide me to tweak script so that still user send me lockout email but I as administrator reset that particular user password and once I recive, I can forward to my users. I have this setup and it is awesome! I modified it to use the ‘code word’ in the body of the text/email so the ‘From’ address couldn’t be spoofed. My only issue is that when I receive emails from an iPhone, the body does not contain the code word. Instead, the body of the email is empty and the iPhone sends the body of the text as an attachment. Anyone find a work around? Possibly checking to see if the body is empty, and if so, read the content of the attachment? What if I want to use the email field in their AD profile(instead of exchange). So basically they could message reset@yourdomain.com with their cell, it would be authenticated through their ad profile but instead of pulling through exchange to email them the reset is there a way the script could just pull from their email in their profile. This would help with google users. I don’t need the script to read their email only authenticate their phone number and then email them a new password. Hey Morgan – this is possible but you will have to tweak the script a bit. Check out Gerald’s reply to Wardag which is a few below your comment. He asked a very similar question. Let me know if you have issues. I want to use this script but want to be able to send from an email address and reply with a new password to another e-mail address … can this be achieved modifying this script ? Just to clarify: are you wanting the password to be sent to another email address instead of from a cell phone? and replace $item.From.address in line 60 with to $userMail.mail, assuming that you have the person’s email address in AD. At first, thanks for the script. In my AD structure, we already have a secondary e-mail address added in the wWWHomePage attribute field. Can you help me. please? My exchange server can not send sms to the sender back. I am having an issue with this script. The password sent to the user via SMS does not match the password that the script sets in AD. Every time a user inputs the password sent to them, they are denied with “invalid credentials”. Any help would be greatly appreciated. I made a few modifications to the script however, none of my changes are related to the random password generation variable. It would be worth noting in your documentation that Quest Active Directory Module is required for this script to run. Go into the script and add a debugging statement above the Set-ADAccountPassword -identity $user.samaccountname … statement – something like: Write-Host $PW, and see if it is the same one being sent to the user via sms; run the line Set-ADAccountPassword -identity $user.samaccountname -NewPassword … by itself and see if the user can login. You could also sms/email the password to yourself to verify it. I'm not that experienced with Exchange so could anyone point me in the right direction? What version of exchange are you running? $email = New-Object Microsoft.Exchange.WebServices.Data.ExchangeService([Microsoft.Exchange.WebServices.Data.ExchangeVersion]::Exchange2007_SP1) to reflect your Exchange 2007 Service Pack version? I've tried all sorts of administrator accounts in the script so I don't understand the Unauthorized code. Is there any special permission in exchange that I need to add? It appears that you might be using an incorrect username and/or password in the $email.Credentials = statement. At least that is what the error indicates. I would like to bring into your notice that I am also getting the same error. I have verified the user credentials are correct. Although, I am using the exchange admin account to run this script. Were you able to resolve this problem? You must use the account that you are going to read the emails from. It is possible that you could give the permissions to another account to read someone else’s emails, but why? Thanks Gerald for your reply. Apologies for late reply, I was badly suffering from fever and was bit away from my work. Then I define the scheduled task to run with the exchange admin account that i usually use to reset users’ password. Thats all what i am doing. Have I missed anything? Please correct me if I had made a mistake. All of your variables look right with the exception of the $domain; it should be the NetBIOS name of the domain. In your example, I would assume abcxyz. This idea is brilliant!!! Any thoughts on, how to pull this off using Lotus Domino Mail Server?? Please confirm , if my understading is correct! I tried sending a text message from my phone to my email. It is reaching my inbox as an MMS (The message format is “phonenumber@myserviceprovider.domain” .Is this an expected outcome ? 2. Powershell script , searches for unread message in inbox of email : reset@mydomain.com ; identify AD id’s of the phone number(s) that sent an email / message. From my mail , i responded to the message that I received from my phone number. I dint not receive a response to my phone. I did not get any failure messages either !! Please shed some light on , how to get this done. You are correct; the code views all unread emails looking for “Reset my password” in the body. If the text is found, it looks in AD, mobilePhone attribute, for a matching phone number. If it finds it, it generates a random password, resets the password and unlocks the account, then it emails the password to the sender, and emails itself only who it reset the password for – audit purposes. If it does not find it, it emails the sender that the phone number sent from is not in the database, and it also sends itself the information of the invalid number – audit purposes again. Finally, it marks the email as read. If Lotus Domino mail uses POP and SMTP, there are numerous sites showing how to use Powershell to view and send email. Simply replace the Exchange lines with POP3 and SMTP functions and you will be in business. seems as if 2003 cannot get use of it due to the missing EWS. Love the idea, but I am wondering can this be adapted to work with a cloud mail solution like Gmail? Also do you need any other 3rd part tool to send the SMS message? I am not sure about Gmail but I would bet you could do it with Office365! Will Steele has a function at http://poshcode.org/3195 that reads gmail via PowerShell. Though it needs work, it is a good starting place. Did you ever get this to work with gmail? Thank you both! Let me know if you have any issues setting it up! Just wanted to let you know I had no issue getting this setup at all. Since this was your project and we do work at the same place. But it is awesome thank you for lowering my ticket load. I do enjoy this concept. At first I was skeptical, but the use of a corporate phone to facilitate the delivery of the password might make it viable. I am pitching the idea to my director to give it a test run. Who knows, maybe it will help alleviate some ticket load from my Helpdesk. I know they would appreciate it.